We feel honored to be able to help you create a lasting memorial that celebrates your life or the life of your loved one. The process of selecting a monument is often a very emotional step, and we understand the value of a caring, trustworthy hand to help guide you through the process. We believe that the service we offer is as important as the quality of our product. Whether you want to memorialize a family member, or you’re planning ahead for yourself, we’ll help you create a memorial that will be unique and personalized for your family. Wherever you are in the process of selecting a fitting memorial for you or your family member, we’ll make sure that your vision is realized. Some customers contact us with a very clear idea of the monument that they want to create, while others have not given it much thought. For those who need some extra guidance, our extensive collection of designs will help you get started. We’ll also ask important questions about you or your loved one to help plan a personalized memorial that will be special and unique for your family. 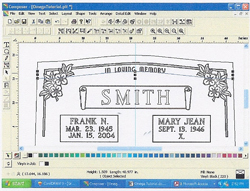 After we discuss your needs, our draftsmen will create a scale drawing of your monument based upon your specifications. We’ll then contact you for proofing and approval. The proofing process involves making sure that the designs are placed where you want them and that the spelling and dates are correct. Once we have received a final approval, it takes about 2-3 weeks to produce the finished product. Many cemeteries have rules and regulations regarding monuments and markers. If we don’t know, we’ll contact the cemetery officials to make sure that we understand the criteria for your specific site, such as the size of the lot and any cemetery requirements. We’ve developed relationships through the years with cemeteries throughout Vermont, western New Hampshire, and northwestern Massachusetts. Because we take the time to find out and understand the rules and regulations of each specific location, we can ensure that the process of installing and maintaining your memorial runs smoothly, without any last-minute surprises. The most beautiful, high-quality monument is less than perfect if it has a poor foundation. Unlike many of our competitors, we install a solid, 4-foot-deep foundation that extends below the frost line. 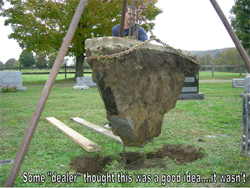 The foundation actually weighs more than the stone, itself, ensuring that the monument won’t move over time. We believe in doing the job right the first time, so that our customers can rest assured that their monument will stand the test of time. Every monument that we install is marked with a small sticker that reads, “Erected & Guaranteed by Clegg’s Memorials or Twin State Monuments”. We guarantee and stand behind every memorial that we install. 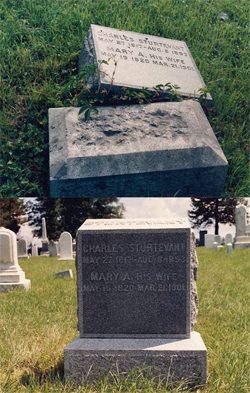 With more than 85 years of experience in monument preservation and maintenance, we will help ensure that your monument stands the test of time. We provide a wide range of services, such as lettering on existing monuments, monument cleaning, and memorial restoration. 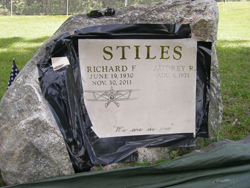 Our lettering services include adding names, epitaphs, and dates to existing memorials. The process of matching new lettering to a monument’s original lettering requires expert craftsmanship. 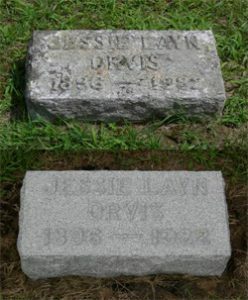 Our talented and experienced craftsmen are highly skilled in the cutting and carving of stone, and they will take the utmost care to ensure that your family member’s memorial retains its original charm and uniqueness. Over the years, a monument’s continual exposure to the elements takes its toll. Keeping your memorial clean is an important step to maintaining it’s natural beauty. Instead of utilizing sandblasting and harsh abrasives that might damage the stone, we use hot, high-pressure water for monument cleaning. And if water isn’t available on the site, we’ll supply it ourselves. From installing new foundations to repairing and straightening broken stones, we areexperienced in all phases of monument restoration. It’s important to tend to maintenance needs and necessary repairs as they arise, if you want to increase a structure’s longevity. We are happy to visit your site to evaluate the situation in advance and provide an estimate for recommended services. We’ve been around for three generations, and we’re planning to be in business for many years to come, so you can feel confident that our door will always be open if you should ever need assistance with your memorial in the future. Our products are produced with strict quality guidelines and because of that we can confidently guarantee your memorial in writing.